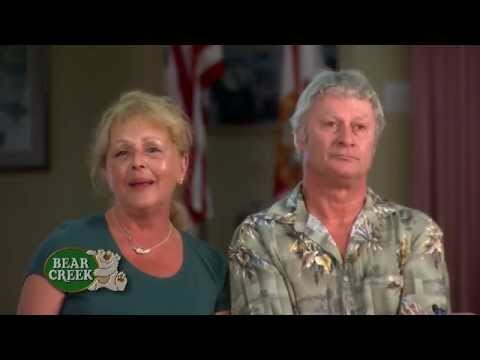 My wife and I chose Bear Creek as our retirement destination after years of visiting communities up and down the east coast—Delaware to Southern Florida. We were looking for a pleasant climate year round, friendly neighbors with lots of activities, and something close to the beach. After spending several days in the Ormond Beach area, we knew Bear Creek was the perfect fit for us. Activities here and in the local Ormond Beach community offer a variety of fun things to do without the expense or large crowds. And the local beach is among the best in the country, not to mention we’re just a short drive from Daytona. Bear Creek is so well maintained and our neighbors here are just the best. … It’s been over 12 years now that we’ve lived here and we’ve had zero regrets! 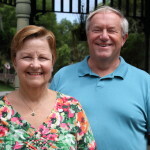 We never intended to retire to Florida, but we visited some friends in Bear Creek and were impressed by the beauty and friendliness of the community. So, when we were finally able to escape the frigid temperatures of northern New York for a few months, we rented a house in Bear Creek. By April of that same year, we ended up buying our own home and became snowbirds. Three years later, we sold our home in New York and became permanent Bear Creek residents. We love the location and proximity to the ocean, and often take advantage of the many amenities and activities here. We also have a dog, Maggie, so it was important to us to live in a pet-friendly community. About one year ago, we decided we needed a larger home. We were able to sell our first home here and purchase a bigger one through Bear Creek’s office, all within one month! We are very happy in our new home. You’ll often see us walking or biking around the community, and we frequent the pools and spas year-round. One or both of us participates regularly in water aerobics, bocce, bowling, book club, karaoke, the Bear Creek Singers and the Little Theatre Playhouse. We also enjoy the Tiki Hut and the many parties, dinners and dances sponsored by the Social Club. 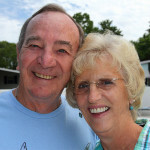 We have made many great friends in Bear Creek with whom we enjoy eating out, playing cards and going on trips and cruises. All in all, the lifestyle in Bear Creek has been a good match for us at this period in our lives. While touring the Palm Harbor model home plant, we saw a pamphlet on Bear Creek and were so impressed we decided to check it out. We purchased our first home soon after. Bear Creek offers their residents so many amenities, events and activities. There’s something for everyone. With its proximity to the beach, shopping and restaurants, it’s a great place to live. Hi, my name is Ed Burns and my wife's name is Claire. We are originally from Milford, Massachusetts. I worked for thirty-four years for the Massachusetts Army National Guard. I managed the Workers Compensation Program. Claire was a legal secretary. We have one son and one daughter. We are blessed with four grandchildren. We looked at three communities in the Ormond Beach area. Bear Creek was by far the best. No other community had three clubhouses and three pools. We also have a first class gym. Claire and I purchased a triple-wide 2002 Palm Harbor home. Our home backs up to a golf course. Our unity is spacious and requires minimum maintenance. Our lifestyle in Bear Creek is fantastic. We enjoy an abundance of social activities. We are involved in the community. Claire has formed a quilt club which meets on Thursday mornings. They held their first quilt show in March. Our residents viewed the variety of quilts that they made. I manage the Horseshoe Program. We meet on Monday and Wednesday. Our horseshoe players support our community by setting up and resetting chairs and tables for Bear Creek events in the various clubhouses. Our neighbors are terrific. Four of our neighbors are celebrating their fortieth wedding anniversary by joining us on a cruise in Alaska. The caring, sharing, and support in our community is outstanding. 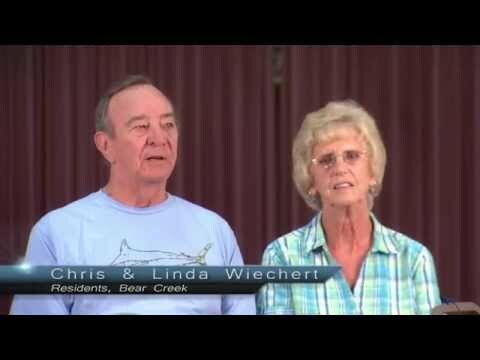 We feel fortunate that we chose Bear Creek as our retirement community. It was a cold and windy February morning in our small town 30 miles South of Boston. We awoke to well over a foot of snow and this was the third substantial snowfall in as many weeks. While still half asleep, we headed out to shovel our walkway and remove the drifts of snow from our cars- pronounced cahs in Boston. The front door opened after some persistent coaxing. 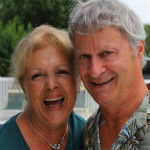 We were growing a bit weary from the harsh New England winters and it was that February evening when we had our first serious conversation about retiring to the sunshine state and settling in a nice adult community. The Internet and various magazines provided us with a great deal of information and we eventually narrowed our search to four central Florida communities that we found appealing and wanted to visit. Appointments were made and we headed south in April. Bear Creek was our fourth and final stop. We were exhausted at this point and almost canceled our appointment. Bear Creek is able to boast that it has not one, not two, but three beautiful clubhouses and three swimming pools. One pool is heated, so there's swimming year round. You would think that buying a retirement home, a big decision, is something that a couple would discuss in length before making a final decision, but we were so impressed with the Bear Creek community that we made a deposit on a home that day and moved to paradise a few months later. The activities at Bear Creek are too numerous to mention, but there's something for everyone. Horseshoes, tennis, bocce, aquarobics, yoga, shuffleboard, poker, and many, many more. In addition, several clubs are often looking for new members and there are always opportunities to volunteer and help out at community events. We have enjoyed volunteering and found that it was a great way for us to get to know our neighbors. We have lived in Bear Creek for 5 years and our only regret is not abandoning our snow shovels a few years sooner.